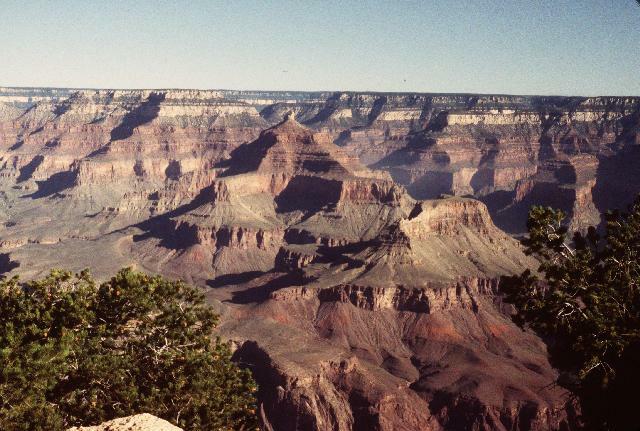 In 1999, I had an opportunity to schedule a trip to the Grand Canyon, and to several other attractions in north-central Arizona. I spent four days in Arizona. During that time, I visited not only Grand Canyon, but also the Petrified Forest and Painted Desert national parks, Sunset Crater/ Wupatki National Monument, Walnut Canyon National Monument, and the Barringer Meteor Crater. Naturally, I brought back lots of photos of all of them. Each is a fascinating place in its own right. But first and foremost was Grand Canyon itself. The Grand Canyon of the Colorado is generally considered one of the wonders of the natural world, and with good reason. It's mind-boggling. You can hear about it, or look at pictures of it, or watch TV documentaries about it -- but still, it's impossible to really grasp the Canyon's immensity until you actually see it. 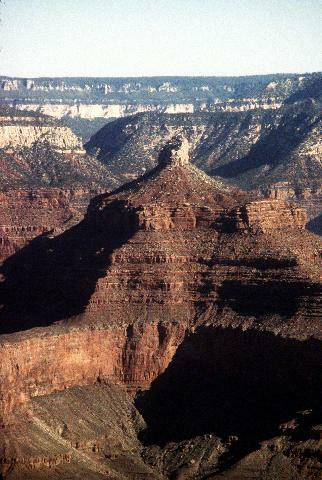 Until you stand at Yavapai Point and look east, and see the Canyon stretching as far as the eye can see (sixty miles on a good day), and you know the Canyon extends another fifty or sixty miles beyond that . . . Then you look west, and see the Canyon stretching as far as you can see in that direction too, and know it extends downstream another fifty or sixty miles . . . Then you look across at the North Rim miles away, across a yawning gulf filled with rock spires, buttes, and mesas . . . and finally you look down and see the Inner Gorge and the Colorado River nearly a mile below you. That's the reality of the Grand Canyon of the Colorado River. I spent a total of about a day and a half (which isn't nearly enough!) at the Grand Canyon, all on the South Rim. 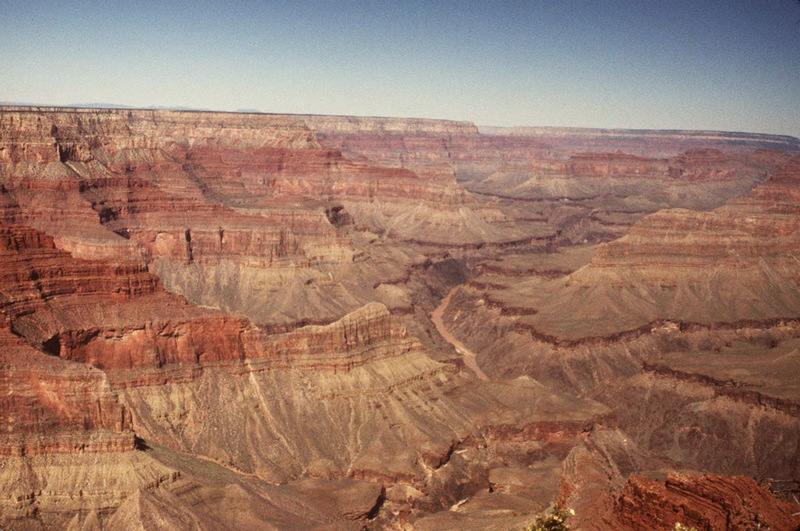 The first day I started at Yavapai Point, a large overlook between the Park entrance and Grand Canyon Village. Yavapai Point gives a wonderful look at the central part of Grand Canyon. My next stop was the Trailhead Overlook, which is just beyond Grand Canyon Village and near the eastern end of the West Rim shuttle run. Besides a stunning overlook, Trailhead is the top of Bright Angel Trail, the trail that the mule rides use to get into the Canyon. The overlook is also directly opposite the mouth of Bright Angel Canyon, which comes into the Canyon from the north, down the path of the Bright Angel Fault. From this overlook I went on to the West Rim Drive, which took the rest of the morning. In the afternoon I headed east to do the East Rim Drive. During the rest of my stay, I also made day-trips to the Petrified Forest and to Sunset Crater Volcano National Monument. And of course I came back with a rich haul of books about the places I went.